Leek Town and Plymouth Argyle Reserves were both crowned divisional champions on 24 March, while changes in leadership saw Liverpool Feds Reserves and New London Lionesses go top. 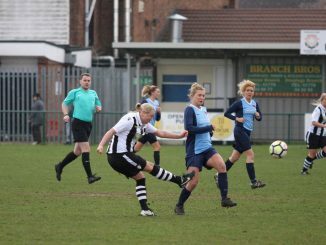 PREMIER – Cambridge City are on the verge of the title after Shannon Shaw hit a hat-trick in the 5-0 win at Wymondham Town, while there were three red cards as Peterborough Northern Star had two sent off and Royston Town one, Hayley Eldred scoring for the latter to sent them second. AFC Dunstable held Harlow Town 3-3, Brentwood Town beat AFC Sudbury 5-1 and Colney Heath edged Bedford 3-2. ONE – St Ives Town substitute Emily Smith got the only goal as the leaders won at Stevenage Reserves. Newmarket Town had to settle for a 3-3 tie with King’s Lynn Town for whom Tiffany Forshaw bagged a brace. Bishops Stortford beat Hertford Town 3-1 for a second win of the season, Histon defeated Hutton 3-2 and Hoddesdon Town Owls were 4-2 winners over Hatfield Peverel with Rosy Wadhams twice on target. PREMIER – Leicester City WFC Development thrashed Peterborough United 8-0 in the top of the table clash, Chantelle Amber and Sian Johnson with two apiece. Oughtibridge’s 10-1 scoreline over Leicester City Ladies included a Millie Kenyon treble, Loughborough Students leapfrogged Woodlands into fifth when winning away to them 5-2, Ollerton Town took the points 2-1 at Kettering Town and Rise Park sent Eastwood to a 3-0 loss. 1 NORTH – Champions Boston United won 3-1 at Grimsby Borough, Ilkeston Town had a similar result against Lincoln Moorlands-Railway with all their goals coming in a seven-minute spell, 3-1 was also the outcome as Sleaford Town saw off Calverton Miners Welfare. 1 SOUTH – Northampton Town were a goal shot of going top after netting four at Corby Town, Lutterworth Athletic climbed above Loughborough Foxes Vixens with a 4-1 victory. 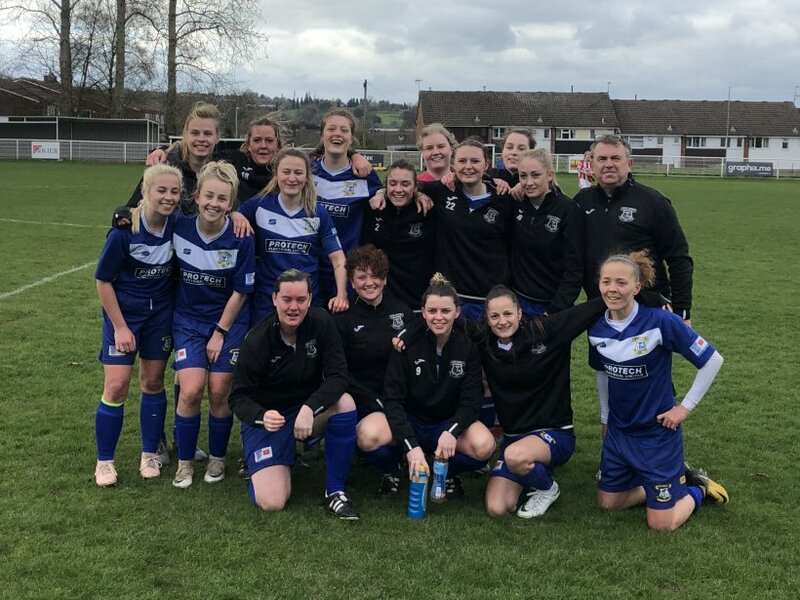 PREMIER – Kent Football United only need one point from two games to be champions after they an Amy Russ treble helped beat Whyteleafe 5-1. 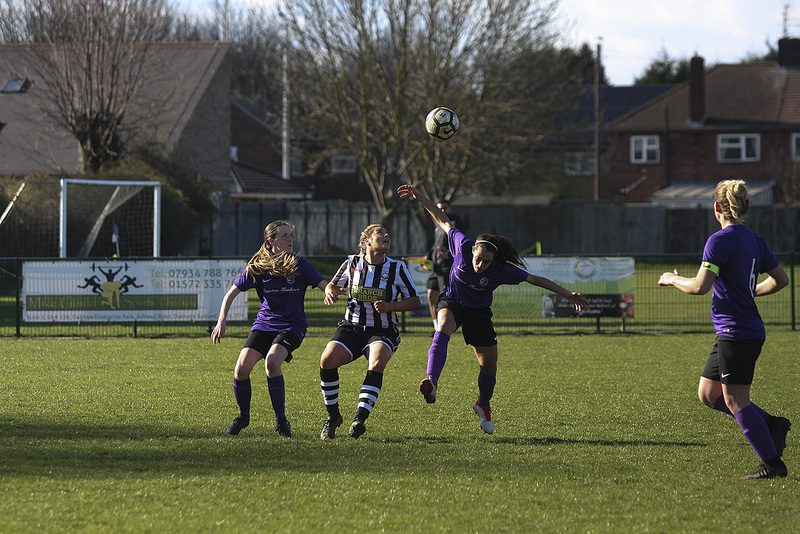 GREATER LONDON PREMIER – New London Lionesses stormed back to the top by walloping Victoire 15-0, Godalming Town Lauren Carnell got a couple in the 4-2 result over Tottenham Hotspur Development, Colne Valley and Regents Park Rangers tied 1-1 in the basement battle. SOUTH EAST COUNTIES PREMIER – Ashford won 3-2 at Worthing to retain slim hopes of finishing first, Saltdean United sent Meridian to a 3-1 defeat with Naomi Robinson scoring twice. 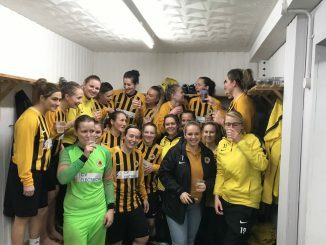 Three goals from Newhaven’s Chloe Winchester was not enough to stop Phoenix Sports winning 5-3, Grace Laverick also hitting a hat-trick despite team-mate Shakira Day being dismissed. Elsewhere, Bexhill United edged Eastbourne LFC 2-1. PREMIER – Lucy Ridley got both goals as Rotherham United had a good 2-1 result against Harrogate Town, South Shields won 6-3 at York City. 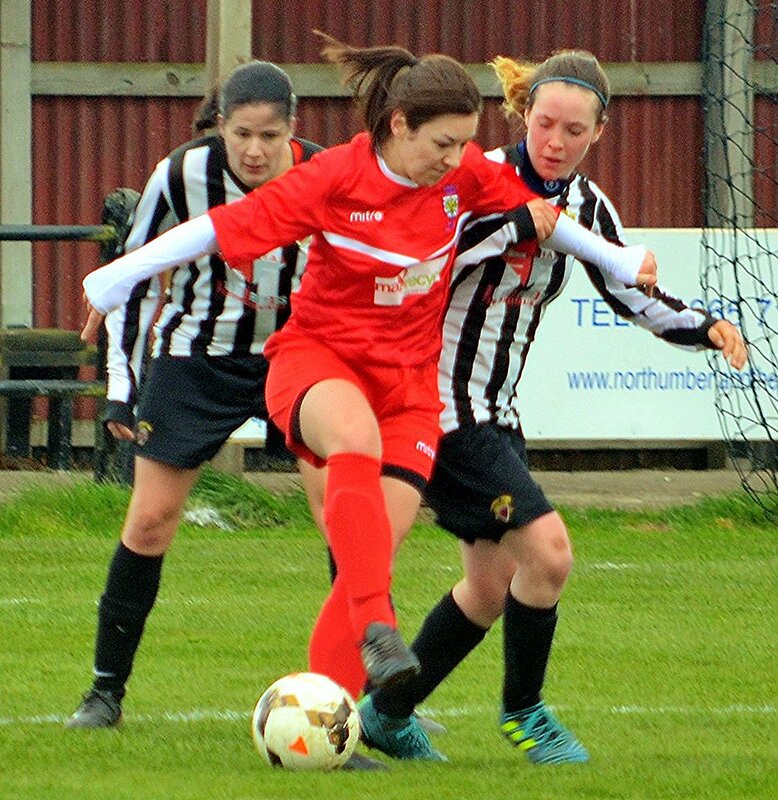 1 NORTH – Consett were held 0-0 at Alnwick Town, Cramlington United finished the campaign pointless after a 6-2 beating at Boro Rangers for whom Jade Featherstone and substitute Alex Hodgson netted two each. 1 SOUTH – A first-half treble by Harrogate Railway’s Nicola Hadley was not enough as Sheffield Wednesday fought back to draw 3-3, while Wakefield went down 5-1 at home to York RI. LEAGUE CUP S/F – Durham Cestria’s Hannah Greenwood got the winner in a 2-1 victory at Hartlepool United and will now face Ossett United in the final. PREMIER – Stockport County went clear at the top with a 2-1 win at Mossley Hill Athletic, Merseyrail picked up the points 3-1 at Penrith and Sir Tom Finney shared four goals with Accrington. 1 NORTH – Leaders Blackpool beat Morecambe Reserves 4-0, Bury kept up the pressure by winning 4-1 at Leigh RMI. Burscough Dynamo have a second win of the season after sending Preston North End to a 3-1 defeat, while Cammell Laird slipped to a 3-2 home reverse against Penwortham Town. 1 SOUTH – Liverpool Feds Reserves are back in pole position with a 2-0 victory at Didsbury, West Didsbury & Chorlton having gone top in midweek by winning 10-0 at Wythenshawe Amateurs. The latter bounced back to beat City of Liverpool 4-1, Curzon Ashton missed the chance to go third in a 2-0 loss at Altrincham and Stockport County Blues were beaten 4-0 by visitors Warrington Wolverines. ARGYLE SPORTS KIT PLATE Q/F – Wigan Athletic reached the semi-finals with a 4-0 victory away to Fleetwood Town Wrens. 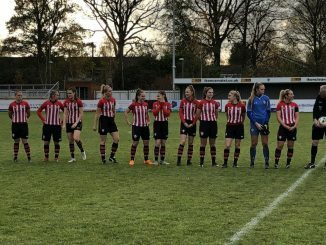 PREMIER – Leaders AFC Bournemouth beat Ascot United 5-1 with braces by Chloe Tape and Meg Vella, second-placed Southampton FC’s Georgie Freeland and Ella Pussey also got two goal apiece in hitting Winchester City Flyers for six. Oxford City also kept up their chase with the only goal at Barton Rovers, New Milton Town’s second win came 2-1 at Newbury, Woodley United went down 2-0 to Warsash Wasps whose Megan Fox got both goals. ONE – Moneyfields’ 5-1 won against Alton featured a Sheree Bell-Jack hat-trick to keep them top, as Abingdon United defeated Eastleigh 5-1 with the aid of a quickfire double by sub Sadie Timbs. Wycombe Wanderers had six different scorers at Shanklin and Wokingham & Emmbrook got the sole goal at Southampton WFC Development. PREMIER – Keynsham Town Development stayed top by a point by beating Bishops Lydeard 3-1, while Exeter City hit hosts Portishead 6-1 with Sian Chapman and Sophie Gillies each on the scoresheet twice. Forest Green Rovers held Marine Academy Plymouth 2-2 and Ilminster Town got all three goals in the match with Middlezoy. 1 EASTERN – The battle for top spot continued as Wootton Bassett Town eased past Laverstock & Ford 10-1 with Emily Arrell enjoying a five-goal haul, Frampton Rangers’ Saffron Degg came off the bench to net three of their six at FC Chippenham. Oldland Abbotonians sent Trowbridge Town home beaten 4-2, Swindon Spitfires’ Laura Stallard scored both their goals in the 2-1 win at Almondsbury. 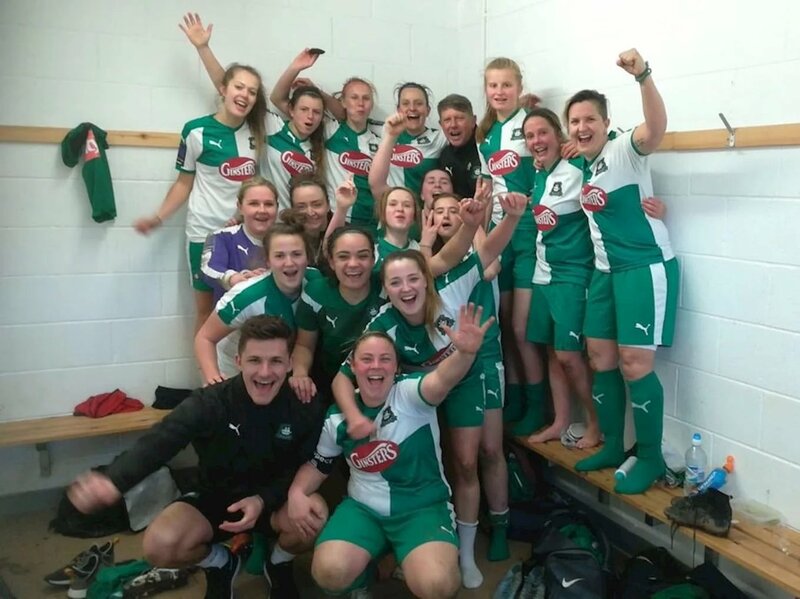 1 WESTERN – Plymouth Argyle Reserves became champions after a 2-2 tie at St Agnes, where Alex Hugh got a double as did home sub Debbie Duncan. Challengers Bideford in any case ended with a 5-2 loss at Weston Mendip, Ellie Oritt with two of the goals. Pen Mill’s Letisha Templer contributed twice in a 6-1 success at Feniton which move them goal-difference ahead of their hosts. PREMIER – Leafield Athletic held the leadership with all seven goals at Coventry Sphinx, Coundon Court finished their fixtures way behind on goal-difference after a 3-1 result at Stockingford AA Pavilion. Sutton Coldfield Town’s hopes are still very much alive following their five goals against Goldenhill Wanderers, Crusaders put six past Lye Town in the other game. 1 NORTH – Leek Town sealed a first place finish with a 3-2 score at Stoke City Development, their fifteenth win in a row. Shrewsbury Town hit double-figures at Florence and Sandwell put four past Port Vale. 1 SOUTH – Solihull United’s 8-2 defeat of Droitwich Spa was their fifteenth straight victory, Sedgley & Gornal United had a walkover at Solihull Sporting, Kidderminster Harriers sent Stourbridge to a 4-1 home defeat and Rugby Town won 4-0 at Leamington.